UK based AstraZeneca is the seventh largest pharmaceutical company in the world, operating in over 100 countries with a wide drug portfolio targeting disease areas including cancer, cardiovascular, gastrointestinal, infection, neuroscience, respiratory and inflammation. Thanks for all your hard work and efforts over the past four years – together we have created a great solution. 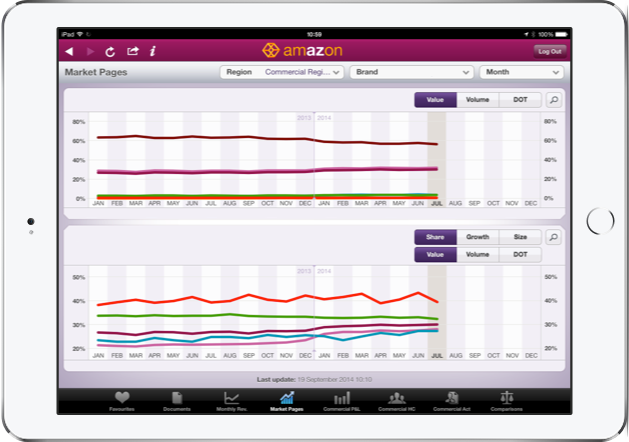 PWC recognised it as the best app they have seen, this time last year I accepted an AZ award for it! Access to sales, marketing and operational data is a key driver in the company's success. 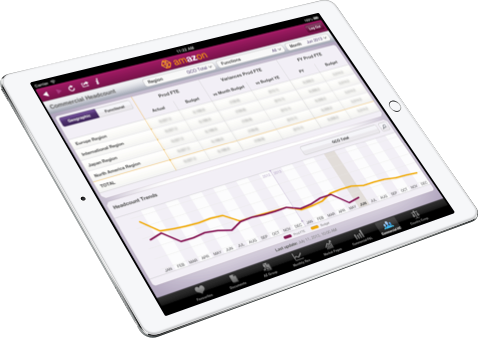 AstraZeneca looked to further develop a prototype iPad app into a day-to-day tool for use by their senior executives and management. The Distance worked closely with TBWA/Manchester to design and develop an intuitive app solution which would be highly accessible anywhere in the world. Working in partnership with AstraZeneca's internal developers over a number of years, the collaboration created a highly successful and engaging tool. AstraZeneca's executives had easy access to important financial data where ever they were in the world. They were able to quickly analyse data sets from various business verticals and produce data-rich (and interactive) slide decks for use in presentations and meetings.